This Hudson River School painting of California Redwoods is aming works the museum plans to sell. Recentlty we visited Muir Woods north of San Francisco. 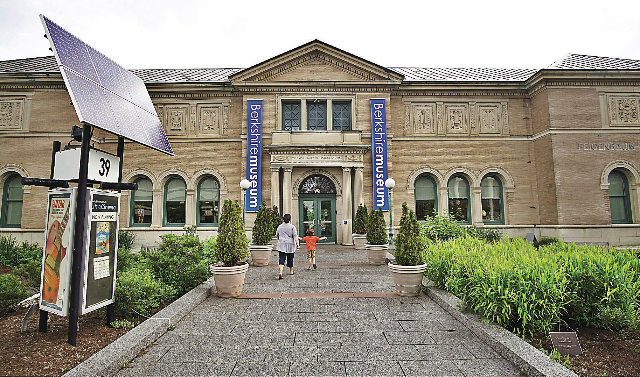 When the news broke, first locally and then nationally, that the Berkshire Museum, facing extinction several years from now, decided to sell 40 key works from a collection of 2,400, to “reboot” as an interactive, educational institution with a focus on history and natural science, the pendulum of public and professional opinion swung wildly. The primo works of fine arts are a small part of the 40,000 objects ranging from butterflies to rocks and fish. From its inception, 144 years ago, it has been an eclectic and eccentric institution. It was founded as a one size fits all cultural and educational resource. It offered a little bit of everything to visitors which has been its quirky charm. The model for museums at the time was London’s South Kensington Museum which was founded in 1857. Later it was renamed the Victoria and Albert Museum. During the industrial revolution it had a broad mandate to gather under one roof plaster casts of classical and renaissance sculpture, arts and crafts, minor and decorative arts gathered from its then vast Empire. Queen Victoria loaned her collection of enormous cartoons by Raphael for tapestries hung in the Sistine Chapel. The collections inspired the anti industrial reaction of the Arts and Craft movement and the museum has its representative William Morris room. Long ago the V&A outlived its original mandate but remains a beloved and fascinating destination. Just like its offspring The Berkshire Museum. Not staying put, however, the V&A has been imaginatively recharged while not abandoning its essential identity. It mounts ground breaking special exhibitions particularly of what the German critic, Walter Benjamin, famously discussed in an essay “The Work of Art in the Age of Mechanical Reproduction.” That entails photography, prints, and mass produced crafts all of which are a part of the BM collection. When in London the museum is on the A list for visitation including a fifteen minute walk into the nearby park to visit its annex the small, but well curated contemporary space The Serpentine Gallery. One project we particularly enjoyed entailed inviting contemporary British artists to place works, primarily sculpture, in a range of galleries. The resultant juxtapositions provided fresh incentive to visit and rethink the context of long familiar collections. With vigor and curatorial imagination that is how the moribund Berkshire Museum might be contextualized and revitalized. On the six year watch of current director, Van Shields, this is precisely what has not happened. A lot of money was spent over the past two years to work with 400 as yet unidentified individuals to come up with the last ditch plan to sell legacy works. With the estimated $50 million from the sale, and another $10 million raised independently, it plans a $60 million reboot. That breaks down to $20 million for another renovation, it’s been less than 10 years since the last one, and $40 million to retire debt and create an endowment. While Shields, who appears to have little or no interest in or commitment to the fine arts, states that there is no money to fund a curator, the museum has retained expensive, high profile PR and marketing to sell its plan. Part of that is to field what is now an overwhelming number of media requests for information which Shields and the museum appear reluctant to provide. This includes the past two years of financial statements and documents regarding works, including two paintings by Norman Rockwell, given by the artist to the people of the Berkshires. Only when its hand was forced the museum releasd the full list of 38 other works being sent to Sotheby’s. 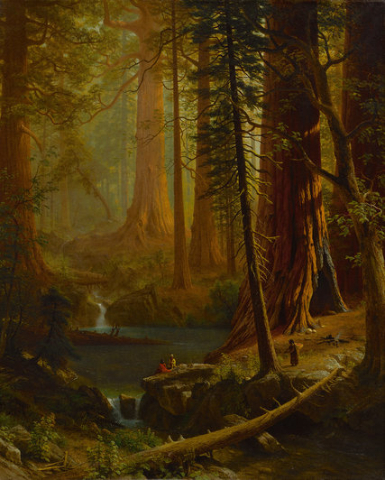 One of these, included in a group of Hudson River landscapes, is a painting by Albert Bierstadt of California Redwoods. 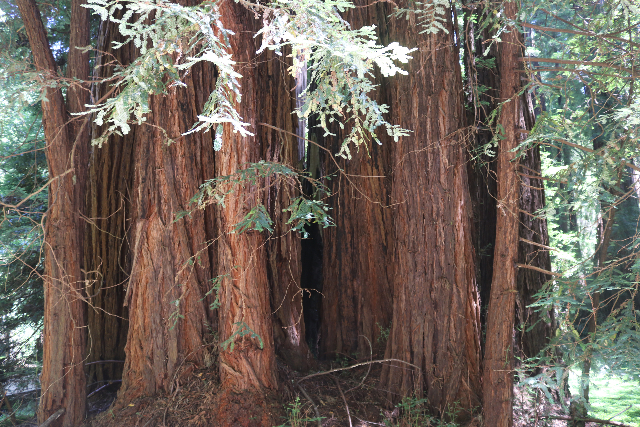 Recently, we spent a couple of hours in the spectacular Muir Woods just North of San Francisco. It would have been a delight to revisit that painting in the museum. Organizing an exhibition combining art with the museum’s depth in natural history would provide an invaluable teaching moment for children to see Hudson River landscapes in context. They would leave the museum with fresh understanding of the spectacular natural beauty of the Berkshires. To show and teach natural science without art severely limits the lesson plan. Now that educational potential is going, going, gone to the highest bidder. There are slim odds that it will be sold to another museum. This is particularly true as the works are tainted by ethical concerns. That may negatively impact sanguine presale estimates. The 40 works, highlights of the collection, leave forever the public domain to which they were entrusted. The draconian professional guidelines for deaccessions, as widely reported, do not sanction selling art for brick and mortar or any purpose other than weeding out and upgrading collections. Other than shunning and shaming offending institutions there is no legal leverage in professional sanctions. As has been stated there is no point in retaining art if you have no walls to hang it on. It is argued that ethical guidelines do not address the existential issues of the Berkshire Museum and other institutions- museums, libraries, colleges- for whom selling collections represents a bailout or means to create new mission statements. While many deplore selling treasured works there in no denying that Shields and the board are caught between a rock and a hard place. Arguably, the museum has been poorly managed over the ten years running an annual deficit of some $1 million. An heir of the founding Crane family, and current trustee, recalled decades when the family wrote an annual check to balance the books. For many years the museum was free for visitors. Now there are many cultural institutions in the Berkshires, per capita double the national average, all requesting support from a small pool of donors. Add to that declining population in the Berkshires and resultant pressure on school systems. That has equated to an aging population which one readily notes in the audience at Tanglewood and other theatre and arts events. One of many blind spots in the museum’s master plan is that its extreme makeover is geared to a diminishing student population. It has conceded itself as Cinderella compared to thriving and dominant fine arts museums in the region. Installing touch screen interactive exhibitions in the galleries is unlikely to attract adult tourists. While the season is short, four months at best, there is a building boom for hotels. With stronger curatorial acumen, rather than money on marketing muddled planning, Berkshire Museum, would have reasonable expectations of attracting its share of tourism. Its ideal location in Pittsfield puts it close to Norman Rockwell Museum, Tanglewood, steps to the Colonial Theatre and Barrington Stage Company, and a half hour from Mass MoCA and the Clark. Nothing emerging from the museum and, its flip-flopping PR, indicates a strategy to leverage an enviable location at the crossroads of culture in the Berkshires. Pro and con passions are boiling over. Despite being in the crosshairs of controversy there is no indication the museum will budge an inch from its hard line, last ditch position. Long term, it’s not neighborly or productive to ignore legitimate criticism. There is concern that Shields and the board went to a drastic plan B before exploring plan A. While it touts having consulted 400 individuals over two years it did so in secrecy. Those who were in those meetings know more than reporters covering the story. Not coming clean on basic information and planning does not inspire confidence. One who was in the room, on several occasions and knows the full picture, is Joe Thompson, director of thriving MASS MoCA. It’s now more than a century since The Berkshire Museum meant just that. Today it is A Berkshire Museum. The Thompson article in the Berkshire Eagle may well be a game changer. As a museum director and neighbor, with friends on the museum’s board and staff, his empathy is understandable. He knows a lot more than most of us. Add to that the epic tale of years of making payroll and holding off extinction. For that Thompson deserves enormous respect. But I do not agree with his plea to write the museum a blank check. Under Shields the museum has shunned Berkshire artists so there isn’t a relationship to build upon. That sharply contrasts with former director, Stuart Chase, who welcomed and worked with artists. When the news broke the Berkshire Eagle endorsed the plans including an editorial. Soon questions of ethics were raised and the Eagle has covered the debate with a daily mix of above the fold news stories, interviews, op-ed pieces and letters. Its position continues to be supportive of the museum’s drastic “reboot” and strategies for survival. A recent editorial, however, raised daunting questions about the manner in which the museum has handled its message. “Why deny access to the museum's profit/loss statements for the past two years? “What is the current location of the art in question? “When and where are the auctions scheduled to take place? “What are the museum's future financial projections? “What are its attendance figures? “Who are the 400 individuals consulted during the conception of this plan? “Who attended the June 12 board of trustees meeting where the move was voted upon? “Where is the actual physical report and study laying out the details of this plan? Coming from the paper of record it is time for the museum to be straight with us. Instead of paying a lot of money for spin that it cannot afford Shields and the board should put the cold hard facts on the table. Its strategy of smoke and mirrors does not inspire confidence in management and essential community support it will need moving forward. Gutting the museum, destroying its architectural treasure, The Crane Room, and its theatre with two iconic Calder mobiles, to create a lobby and soaring atrium is defiling and unimaginative. Then filling galleries with touch screens and trendy bells and whistles may be of the moment but will soon be as out of date as last year’s I Phone. Keeping up with the spin cycle its $60 million pot of gold won’t last long. It will surely fall far short of its hyperbole of assuring the museum’s next 114 years. More than just cash it needs vision and curatorial creativity. As of now there is no evidence of that. "Thanks for the update. Isn't it interesting that we have come to think that throwing money at a problem will solve it?"